Flat Green roof installation is the latest style of flat roofing, usually complemented with underlying GRP or EPDM Flat Rubber Roofing materials. Why I hear you say? After all, from my vertically challenged point of view, (I’m only 5ft tall), I’m never going to really see it, am I? Well that aside I want to tell you about 5 very good reasons why Flat Green Roofs and Flat Green Roof Extensions are taking the domestic and commercial market by storm. Customers have said that a flat green roof installation is an ideal choice for the environment when the time comes to have their flat roof modified or replaced. Firstly, going green, is not just a socially responsible strategy, it’s also means your flat roof will look good! A beautiful finish to your flat roof will bring colour and life to your property, A green flat roof installation is designed to blend in naturally with the environment and is pleasing to the eye, You may never mimic the tropical delights of the Rain forest from ‘Avatar’, (if you haven’t seen it yet, you absolutely should), but the message is becoming clear – customers want things that look good. 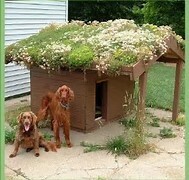 A flat roof can sometimes look uninteresting and unattractive but a Green Roof installation will do just the opposite. Finishing touches with a variety of seeded or planted sedums will ensure there are flowers at different times of the year. There will always be something interesting to look at. I’ve seen dog kennels, man-sheds and flat roof extensions, caravans and summer houses going green, and it puts an individual stamp (or should I say footprint?) 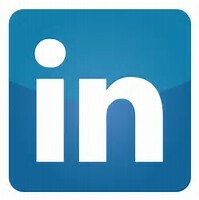 on your property and the environment. There has been a huge development in the interest of environmental concerns, and with that green roofs are becoming more and more popular. Customers are realising that not only will their green roof blend beautifully into their urban and garden areas, but they are doing something responsible to help with the environment. Remember that wildlife will love your green roof too, since the soil will attract more places for birds to feed, and so bring new wildlife to your garden or property. A grass or sedum flat green roof will improve air and water quality since the plants will spend their time working hard to give us Oxygen, which let’s face it, we all need. Conserving energy is important and the thick layer of insulation on a Flat Green Roof achieves this really well. A greater thermal performance and protection from the elements means buildings are cooler in the summer, and the heat is kept in in the winter. This typical energy efficiency reduces energy costs. Your Flat Green Roof is alive! This is good because when it pours with rain it will soak up massive amounts of water. Rainwater is trapped by the layer of earth and greenery, therefore any potential flooding can be prevented during heavy downpours or storms. Did you know, in summer, flat green roofs can retain 70-80% of rainfall and in winter they retain between 25-40%? Don’t forget you can expect fewer leaks too, because the membrane is protected by the earth from the extreme weather conditions; this will also increase the life-span of your roof, so it’s a win-win situation. I know I would prefer to look out at a garden than a boring plain flat roof. The colour green provides a sense of calm and harmony, and most people feel naturally reassured when they are surrounded by ‘Mother nature’. A flat green roof installation can be implemented with little or no modification to the roof structure, however one of the ideal times to have your flat green roof installed is when you realise that it needs replacing. This will call for the services of a professional, as it is essential that your roof is checked to ensure it can take the load of a Green Roof which has been fully saturated with rainwater. Once this has been checked and approved the installation can then go ahead. To sum up, people have started to adopt a more socially responsible attitude to combat global warming. Therefore, a flat green roof installation is the perfect solution which also gives a beautiful finish. 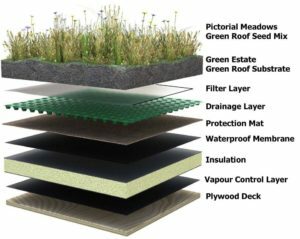 There are several types of flat roof installation to choose from, which will ensure you have the right system for your green living roof. For example as professional installers, R&D Roofing can fit either an EPDM rubber flat roof system or a GRP Fibreglass system. Both of these Flat roof solutions come with a 20-year guarantee and a much longer lifespan! Of course, if you do not need your flat roof replacing just yet, it is still possible to adapt these systems to a flat green roof specification. If you would like feedback on our workmanship and services, please take a look at our latest Check-a-trade report. I hope you’ve enjoyed reading about Green Roofs, and please feel free to get in touch if you have any questions or queries; I will be happy to help. Excellent information provided on the benefits of green flat roof installation. We really need to be serious about our environment. 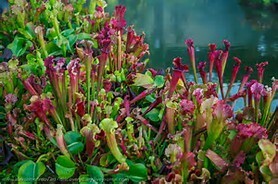 Choosing green roofs is one of the admirable decision. Agree! Green roofs not only helps in keeping the inner areas cool but are also helpful from the environmental perspective. Also, the beauty of a home is doubled with green roofs.